When Hurricane Sandy struck New York City, it caused dire consequences throughout the metropolis, but especially in a section famously nicknamed Bedpan Alley, a sprawl of hospitals and other medical facilities that stood in the path of the storm surge along First Avenue, just a block from the East River. Hospital workers struggled heroically to save patients, but they weren’t all that was in danger. 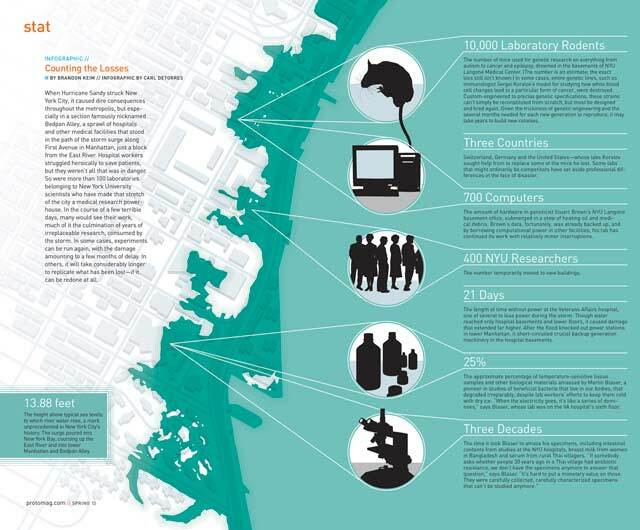 So were more than 100 laboratories belonging to New York University scientists who have made that stretch of the city a medical research powerhouse. In the course of a few terrible days, many would see their work, much of it the culmination of years of irreplaceable research, consumed by the storm. In some cases, experiments can be run again, with the damage amounting to a few months of delay. In others, it will take considerably longer to replicate what has been lost—if it can be redone at all. Click on the infographic for a larger PDF version.